Jonny Armstrong isn’t your typical photographer, as he is also a scientist who, through researching salmon in Alaska, turned his attention to the abundance of wildlife that lives there. 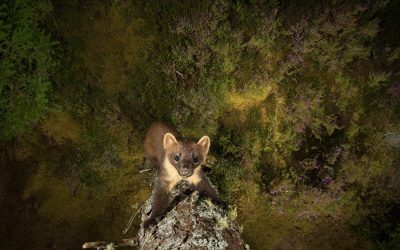 His extraordinary work has recently seen him awarded as both runner up and commended in the 2014 BBC Camera Trap photo of the Year competition. I’ve been researching salmon in Alaska for nearly a decade, often working in close proximity to grizzly bears. In the region where I’ve spent most of my time, the bears are difficult to photograph. They are not human-habituated and they spend a lot of time feeding on salmon in small streams, where they are difficult to observe until you are too close for comfort. Folks I worked with used trail cameras to photograph bears, so that’s probably what planted the idea of camera trapping into my brain. However, I would have never pursued the idea had I not become interested in off-camera lighting. In 2011 I picked up a couple speedlights and began experimenting with flash photography. I quickly became obsessed with the creative process of adding light to a scene. 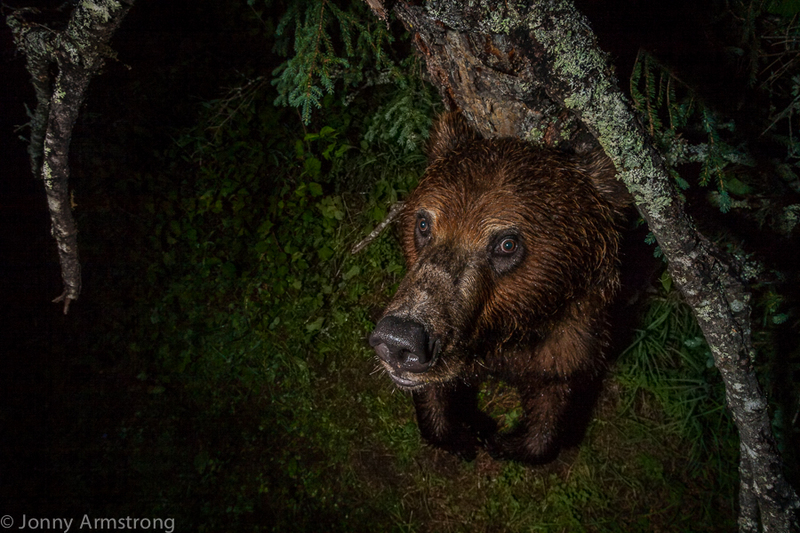 This interest in lighting was what led me to build camera traps to photograph bears. I wanted to take lit portraits of wild animals and I knew camera traps were the best way to do this. "In 2011 I picked up a couple speedlights and began experimenting with flash photography. I quickly became obsessed with the creative process of adding light to a scene." The key advantage for me is being able to slow down. Traditional nature photography is often rushed and frantic as you try to capitalize on a fleeting encounter with an animal. There’s often little time to think about anything except nailing the focus and exposure. 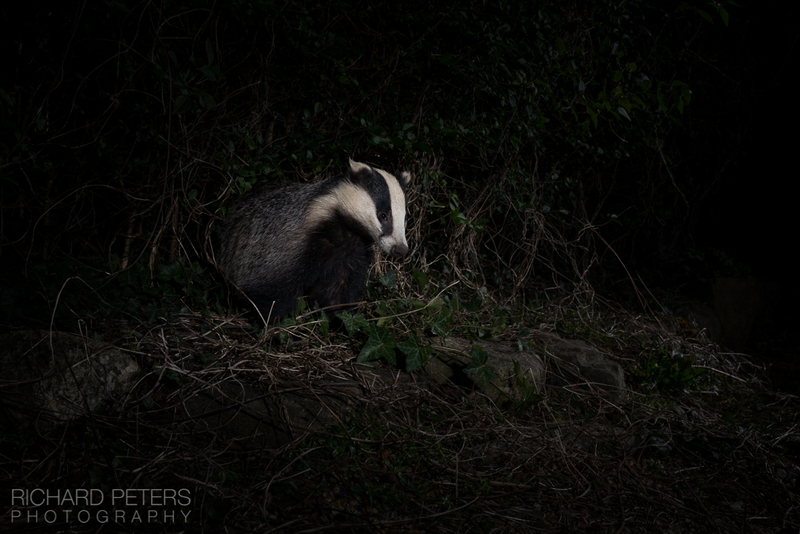 I love that when I’m camera trapping, I can work slowly and really think about the image I’m trying to create. I also love that camera trapping can allow nature photography to be collaborative. For example, my friend Jason Ching and I have made dozens of camera trap sets together, both of us contributing to the final image. The more obvious advantage is being able to shoot elusive or nocturnal species that we as humans rarely get the opportunity to see. There are several species that I’ve never encountered in real life, but I’ve captured them on camera traps dozens of times. However, I think most iconic wildlife species are actually a lot easier to shoot in person than with a camera trap; for example wolves are extremely difficult to camera trap but fairly easy to shoot with a telephoto lens in certain National Parks. The remote aspect of camera trapping is extremely challenging. Not being able to adjust settings in real time is a huge disadvantage, particularly when you don’t even know what species you will be photographing or under what lighting conditions. I recently made a set for moose and the first animal that showed up was a bobcat; last winter I set for cougar and I got a close-up shot of moose legs. While these surprises are perhaps the most fun aspect of camera trapping, they make it difficult to take good pictures. Most of my camera trapping action occurs at night, so I have zero ambient light to work with. Lighting a night scene is incredibly difficult. In a studio (another situation with no ambient light) you’d at least have walls to bounce light off and fill shadows, but outdoors, anything that’s not getting hit by a flash is going to be a black shadow. Further, the wide-angle lenses we often use in camera trapping allow us to include more background and context, but it’s very difficult to light these portions of the photo at night. The speedlights that lend themselves to camera trapping really aren’t sufficient for casting even light across large areas. Working at night is a disadvantage in the sense that it’s extremely challenging, but it also allows us incredible creative opportunities. Lastly, it’s really hard to be a good trapper and a good photographer. I find that every step I take to improve the photographic quality of a set decreases the likelihood of an animal approaching the set. 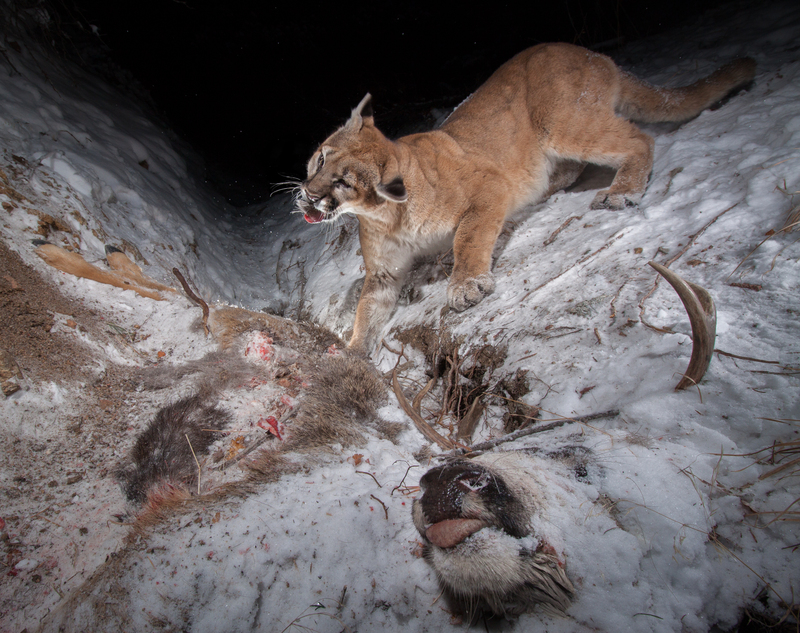 A huge disadvantage for camera trappers is that we need to get animals within a few feet of our camera. Where I live in the American West, carnivores were heavily hunted and trapped during the past 150 years. It’s often quite challenging, if not nearly impossible, to get these animals to approach a camera. I’ve gotten one coyote on a camera trap despite the fact that they are by far the most abundant carnivore where I live; I can see from their tracks how they avoid my cameras. Numerous times I’ve gotten animals on game cameras and then failed to get them on my more conspicuous DSLR camera traps. "Where I live in the American West, carnivores were heavily hunted and trapped during the past 150 years. 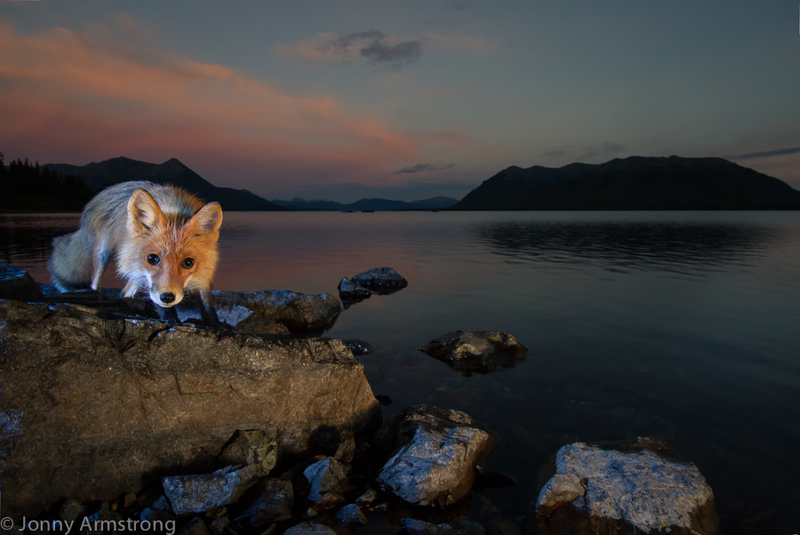 It’s often quite challenging, if not nearly impossible, to get these animals to approach a camera." I am always dealing with some gear/weather/critter issue. I just did some camera trapping while visiting family in Oregon. Squirrels chewed up the wires on 3 out of 5 camera traps I set out. A black bear thoroughly dismantled another one. Then it rained hard and got really humid, causing my camera boxes to fog up. You fix one problem and another one pops up. Where I currently live in Wyoming, the wind drives PIR sensors nuts. I’ll leave a set out for a couple weeks only to find the camera ran out of batteries the first day from false triggers. I’m constantly tweaking my gear to deal with new challenges as they emerge. My most elaborate equipment is actually my grip gear (lights stands, clamps, etc.). It’s important for me to be able to put my lights and camera exactly where I want them. I have some camo-painted C-stands that are heavy and in no way practical for camera trapping, but they allow me to achieve the lighting that I want, so I’ll bring them just about anywhere. I barged one to Alaska. I went into camera trapping blind to what was already out there, both in terms of photographs and gear. I built all my housings and trigger systems myself, which was fun, but in hindsight not the brightest idea. I used to require 80 lb. of batteries for a 2-week set. Then I met Jeff Dale, the owner and operator of TRLcam. Jeff helped me fix up my homemade systems, and now I have a much more efficient design. I typically use a simple PIR sensor as input for a Picaxe 08M2 chip, which controls camera operation. Currently I’m building about half of my own gear and relying on TRLcam for the other half. I am really excited about the images I’ve taken of Pacific fisher. 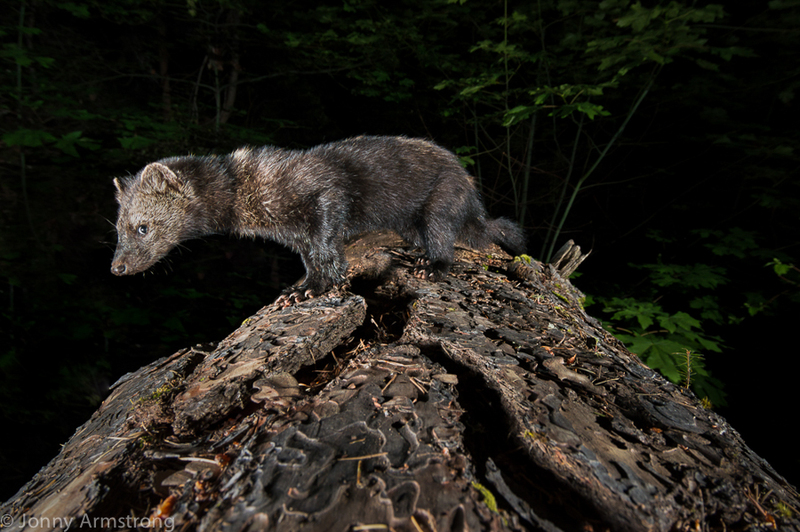 Most people don’t know what a fisher is; they’re sort of half way between a marten and a wolverine. The Pacific fisher was just proposed for listing under the Endangered Species Act. They’ve suffered from habitat degradation in the past and now the remaining populations are being exposed to poisons on illegal marijuana farms. I didn’t set out to photograph fisher, I just had one show up on my camera one day about a week into a set on a friend’s property. It’s been really gratifying not only to see these amazing animals on my camera, but also to share the images and give people a glimpse of an animal they previously didn’t know existed. I’m working now to develop a body of work on fishers that can be used for conservation outreach. Most of the existing photos of fishers are from zoos or animals captured during research projects; I consider my fisher photos to be my most successful endeavor because I think they really do provide a unique perspective of nature. I’ve had too many to count. Luckily I’ve gotten second chances after a lot of failures. The first time I got a fisher I was borrowing some cheap flashes that didn’t work; I got a nearly black frame and could just make out a hazy silhouette after I bumped the photo up +5 ev in Lightroom. The first time I saw cougar tracks I set on them and left my camera for a few weeks. I came back and found fresh cat tracks, but discovered my camera battery had somehow died the first night out. For a few summers now I’ve been going for a specific shot of a grizzly bear in Alaska. Each time I’ve had a sow and cubs take out my camera. A trail cam on the set showed the cubs playing with my camera box after knocking it over. It also rains like crazy in Alaska during the summer, so I’ve had lots of good shots where the lens is covered in raindrops. I’m perhaps most haunted by a set I made for cougars last year on a ridge line trail at about 3000 m elevation. I really liked the set and felt like I’d really nailed the lighting. I came back to find my light stand had been blown over by 60 mph winds and in turn knocked my camera/tripod over. When I checked the photos I found that after everything had fallen over a cougar came through—I got a blurry shot of its paw. A week later it happened all over again, even with big rocks strapped to my lightstand it tipped over; I managed to get a decent shot but I’m still tortured by what it could have been. After that the cat never returned. I can understand that there could be some resentment of camera trapping from folks that do sit-and-wait photography, spending dozens of hours in a blind to get a shot. However, to call camera trapping cheating doesn’t make sense. 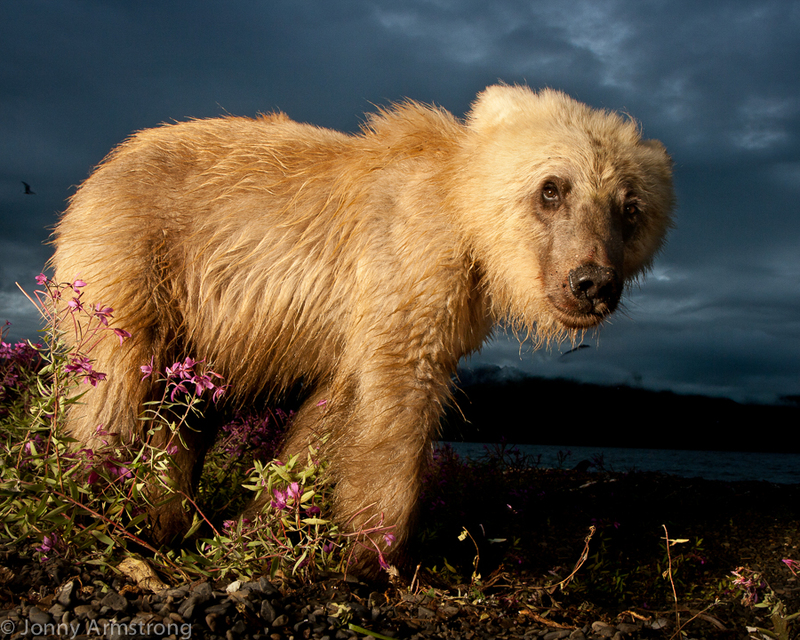 Camera trapping is typically far more demanding than traditional nature photography. Just getting a camera trap to work is a major ordeal, often involving computer programming and endless fiddling with electronics. Then you have to learn the completely different skill set of trapping—figuring out how animals use a landscape and what might lure them to a set (or scare them away). Lastly and probably the most challenging, you’ll probably be shooting in the dark, so you’ll have to use artificial light, something most nature photographers are terrible at. Plus you won’t be starting with an easy lighting assignment; lighting an animal in a night scene is much harder than working with humans in a studio and you won’t find a web tutorial to teach you how–you’re on your own. Some probably perceive camera trapping as requiring less patience than handheld photography, because we don’t have to be there while our cameras wait for animals to show up. I’ll just say that anyone who has tried camera trapping knows that this is not the case. There’s a backyard fox that has evaded my camera traps for four years and counting. I see it progressing in two directions. One will involve increasingly creative placement of cameras for journalistic sort of endeavors. For example, Lars Holst Hansen put a camera trap inside a muskox carcass to photograph scavenging foxes; I thought that was brilliant. The second direction I see is in portraiture, as in more subjective portrayals of animals and nature. That’s where my focus is. I already objectively document nature in my job as a scientist, so I don’t feel a need to do that with my photography. I think most camera trappers still think like nature photographers, which is fine. However, I think more people are going to approach camera trapping as environmental portrait photography and we’re going to see some very interesting images. National Geographic and other publications encourage photographers to capture nature as their eyes see it. In contrast, I’m most intrigued by photos that reflect our imagination of the wild; I’m interested in how people envision nature rather than what they actually observe. To view more of Jonny’s incredible body of work on the Alaskan wilderness, please do visit his website. Johnny body of work is so remarkable, i have been trapping for 2 years and everytime I see his work it motivate me even more to achieve better and better quality photos and be able to tell a story on how the animal live in his enviroment, for sure Johnny is in the for front of camera trapping.